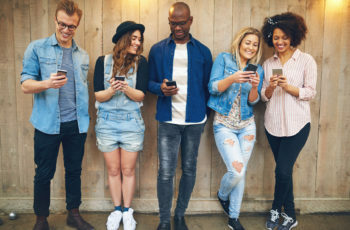 According to research, 93% of millennials spend time on social media networks and 62% are more loyal to brands that engage with them via OTT messaging and SMS. In fact, social messaging apps have a much larger community than social networking platforms, despite being predominantly owned by the social network platforms themselves. This is why you need to incorporate social media into your digital marketing plan. But, and it’s a big one … using a social media channel that’s a wrong fit for your business or even getting your content wrong could do more harm than good. Social media trends are the same as any other – wait until they blow-up and you’ve already given a headstart to the competition. Early-adoption seems to be a phrase that has found a common place within the tech world, and while we aren’t keen, it does have relevance. Spotting social media trends early on and incorporating them into your digital marketing plan is crucial to maximizing any ROI for a marketing campaign. Of course, you could just do what you’ve always done – it’s always worked in the past. Right? It wasn’t that long ago that Facebook announced that they give priority to content (this includes paid adverts) which uses video to communicate a message. Or that Google pushes you down the page ranks for having a non-responsive website. While that may not relate directly to social media marketing, it does show you that you need to keep on top of the latest digital trends, or you’re going backward. Currently, social media trends are looking toward social messaging, live video, virtual reality and social commerce. We’ve already highlighted the fact that Over-The-Top messaging platforms (like Facebook Messenger) have a wider use and community base than the network itself. You may be surprised to read that WhatsApp and Messenger process over 60 billion messages every single day; between the two, they have a 79% share of the instant messaging market. There are a number of live video streaming services available, perhaps the one taking the social world by storm at the moment is Facebook Live. Not only does it allow you to keep a very personal profile, but it’s also a great way of showing off what you do. A picture paints a thousand words? What can a video do? Imagine being able to show people (instantly) just why your ACME Tunnel Effect Paint is better than any other on the market? How about customer reactions when you find and fix that squeaky thingamajig that’s been ‘driving them nuts for months’? In days-gone-by, companies spent thousands of dollars to create and run a video marketing campaign, now you can do it in an instant, for free. Taking it a step further; a TV advertising campaign could have cost tens perhaps hundreds of thousands of dollars, it may reach millions of people, but are they your demographic? Social networking platforms allow you to drill down to specific target markets, for a fraction of the cost of TV – if you’ve done your research, every one of them could possibly want your product or service. In a similar vein, Virtual Reality has been used to great effect when it comes to marketing. Although it has been reasonably slow to be adopted, VR is definitely going to be big in 2017. Currently, Virtual Reality is best-suited to certain markets – real estate VR is increasing month on month, but this is helped with the use of Augmented Reality. There are some negatives to be aware of, though. The technology needed for a full Virtual Reality experience doesn’t come cheap and let’s be honest, you’re going to look a little silly. But … if you don’t mind the look and you can supply the tech for your customers (used on-site at your premises for example), you could very much be onto a winning strategy. WeChat reported last year that 31% of its users initiated a purchase through the platform. And with 806 million active users, that equates to just under 250,000,000 sales. That’s a figure that is hard to ignore. It makes good sense really – with so many users online, using their cell, tablet or computer to interact with all virtual things, the element of trust is already with them. The days of not trusting ‘the internet’ are pretty much done. 88.5% of the American population is now online. It’s second nature to find a company online and then just click the ‘Buy It Now’ button – in many cases, we no longer even have to key in payment card details. It’s easy, convenient and secure. Digital marketing is so much more than identifying or using the latest social media trends. We have a whole host of How-To guides to help you better understand the world of digital. Don’t assume that your business is up to speed with the current trends – ensure that you are. Missing out on any key marketing platforms is just like giving money away; we’re sure your competitors will love you for it, but maybe not so much your bank manager. Social media trends and marketing are now a bigger aspect of marketing your company than traditional media – do it professionally and you won’t regret the investment, both financially and time-wise.